Can I brew coffee in this urn? No, coffee urns and coffee chafer urns are designed to hold hot coffee at appropriate serving temperatures and cannot be used to brew coffee. 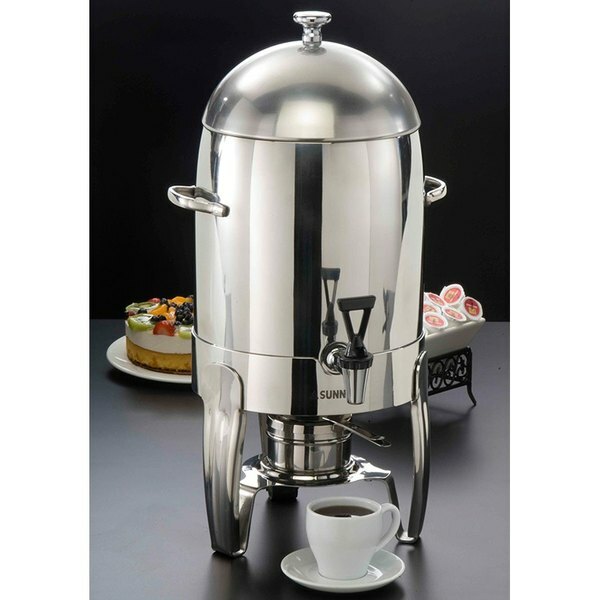 This 3 gallon American Metalcraft Allegro ALLEGCU2 coffee urn offers a classic, chafer-style design, perfect for use at elegant banquets, buffets, or catered events. It features a strong, durable stainless steel body with matching legs for a distinct, sophisticated look. For ease of pouring, this coffee urn uses a quality faucet, ideal for pouring hot coffee, water, or hot chocolate. American Metalcraft Allegro ALLEGPBWL Punch Bowl - 14 Qt. Coffee Chafer Name Plate - "Coffee"
Coffee Chafer Name Plate - "Decaf"